Love can be the easiest and the hardest emotion all at the same time. It can be easy to love somebody at first, but then seem like the hardest thing in the world to see that somebody love someone else. In Honey and Clover, there is no real romance nor does anyone actually date anyone else, not even minor characters. Instead, the show brings out what we ourselves never really show, and that’s the struggle of loving someone from afar. All the main characters have their backgrounds, motives, and personalities, but each one reflexes an emotion that we have all felt at one point in our life time. This is a shōjo anime that almost anyone can take to heart. It focuses more on the male characters of the show versus the two females, but plays out in an arc driven fashion. A couple of episodes usually focus on one character in the group of friends that are all constantly having problems that they must solve. It is an anime that shows what finding yourself in your group of friends, co-workers, and romances is like. The show takes place in an Art School in Tokyo, where most cities bring out emotional ties between different people. The cast of characters are just as different from one another as any two people can get. Ayumi (far left) is the master of ceramics in her class and is loved and admired by almost every guy who knows her. She is called the “Iron Lady” because of her strong reactions to people who do not do what they are suppose to be doing. Mayama (top center) will be known as the grumpy older “sibling” who will try to be the mediator in any given situation. It turns out that he is only an incomplete version of who he really wants to be though. Morita (bottom center) has to be the most carefree and mysterious person on the show. He is in his 6th year in college, never quite able to finish enough class hours to be able to graduate. The mysterious thing is that he goes away without telling anyone where he is going, only to come back with stacks of 10,000 yen bills. 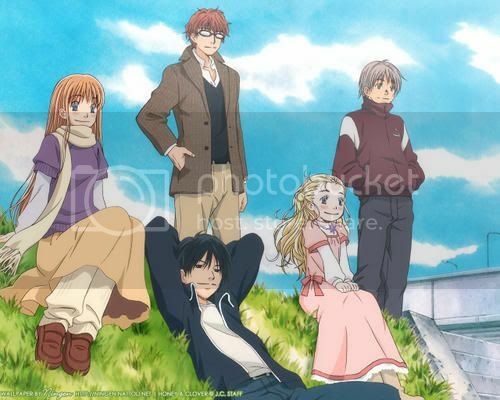 The last two characters are Hagu (middle right) and Takemoto (far right). Hagu is one of the most shy girls in anime and it does not help her confidence when it comes to her height either. What she lacks in physical form, she makes up in the beautiful artwork that she creates. Since she has great talents, she is also under a lot of pressure to always be great at her artwork. Hagu is a girl who knows what she wants, when she wants it, and how she wants to live her life. Takemoto on the other hand, is the complete opposite. Being only the average art student, he never knows what direction he wants to go in or what his future ambitions are. Even though he has a lot of setbacks, he still continues to hold his head high, and admires Hagu for being what he cannot become. The main purpose of this anime is to show the internal struggle of a one-sided love that each character endures along with being able to find themselves. Without giving anything away, most of the characters go through what every person has gone through in a one-sided love. Feeling your chest tighten when you see the one you love with another person whom they have feelings for. Having someone take away the one you love in front of your very eyes by hogging all of their attention. Situations that we all go through, seeming nostalgic and familiar as you watch each episode. The show hits on a lot of emotions, which will surely stir up some emotions of your own. The other purpose of the show is to display the journey of self-realizations. Everyone has a self-realization or epiphany from time to time, but this is the self realizations of five very different people, all of them friends with each other. Just how we all realize when it’s time to give up on fantasy love, or to continue trying because you know nothing else but that person. Sometimes we need to learn how to let go of someone you’ve depended on, only to find yourself needing to depend on someone else. Finding yourself may be the best thing anyone can do for themselves, but remember to take a break and be yourself. Everything I’ve said is what embodies Honey and Clover, plus so much more that I cannot tell you! After watching the first couple of episodes, I thought the characters would never get along. They were all way too different from one another that they did not seem compatible with each other. As the show went on though, you discover that each one of them has their own personal motives and “secret” personalities that they hide from each other. Even though they never really show their true selves, their inner personalities finally click with one another. This is one anime that I loved to watch over and over again. There are only a couple of filler episodes, with more of a story arc system where circumstances in relationships and situations change to keep the story fresh. I never got bored with this show once, and with all the likable characters, I felt as if they were real people. This is a recommend to everyone who has ever experienced a one-sided love and needed to find themselves in the world. Similar Animes: Toradora!, White Album, Myself Yourself. Morita was one of the main elements that made this show enjoyable for me. It lacked some of what I was looking for when I went in, but he made up for it. I read this while Shojo Beat was still in print and I loved it (i’m not being a hipster, it’s just background info). So much so, in fact that I bought the manga for a friend for her birthday. With that said, I loved the anime. I’m one of those non-purists who actually likes the dubs if they are available when I want to watch something, so I watched it in english. I really liked the performances and I loved that the art style matched the manga so well. I think your review is really accurate. Oh, and if anyone read Nana, the anime matches the drawing style in that one too.